Jesse urges people: Live right and be right. 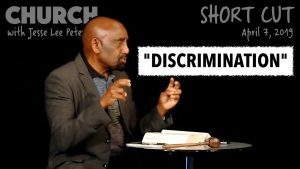 He asked the Biblical Question: Do you discriminate? Be honest with homosexuals. Regarding Joe Biden: Do you trust what you see with your eyes? At Church Sunday, Jesse started out talking with newcomers. A 24-year-old was still living at home with his parents. Jesse urged him to move out. (Watch 5-minute Short Cut: 24 and Still Living with Parents?!) Another first-time visitor Eva from Germany, brought her sister. Some of these people found us via “Jesse Lee Peterson SAVAGE Moments” series by the YouTuber account Get a Job. 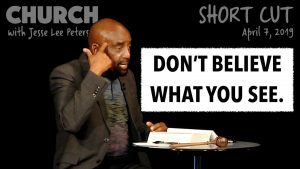 BIBLICAL QUESTION: DO YOU DISCRIMINATE? Jesse talked a little about his Biblical Question of the week last week: Do you discriminate? People gave their feedback. Some say they do, while others said they do not. Jesse also discussed some news items: Chicago elected its first black lesbian mayor. There’s a “gay” man running for president, pretending he’s a Christian. One man comments about the intelligence and cunning of evil. How do you fight this invisible battle against evil? Jesse answers: First you must wake up within. Don’t give in. The Great White Hope (President Trump) does not cave to evil people. Jesse talked about the BOND Couple’s Seminar which occurred the day before. He also pointed out that one woman in Congress is living with her boyfriend (Alexandria Ocasio-Cortez calls him her “partner”). People voted for her knowing this about her! Yet another young woman asked about her 18-year-old brother in high school. She’s concerned that he is not working nor preparing to move out in September. But her mother had her move out after she became an adult. So if the boy is not ready, let him move out and let him suffer — but drop it and stay out of the way. She also asked how to deal with employees who are older, since she’s already a manager at age 21. Jesse urges her to treat them as she’d want to be treated. She doesn’t feel they respect her because of her age. But if that’s the case, it’s on them. Take the proper steps if they fail to do their job. A man says his generation was influenced by TV — especially with how corrupt it’s become. Parents should not allow their children to watch TV for the most part anymore. A young lady from the San Francisco area said her school was a “safe space,” anti-racist, and she’s the only girl who’s completely straight. She said her best friends and classmates are things like “bi,” “pan,” “gender-fluid….” Jesse told her not to worry about it. JOE BIDEN: DO YOU TRUST WHAT YOU SEE WITH YOUR EYES? Watch 7-min. Short Cut: Joe Biden “Creepy”? Don’t Believe What You See with Your Eyes. Jesse asked people: Do you trust what you see with your eyes? Some said yes, while a number said no. People have been accusing former VP Joe Biden of being “creepy.” They base their opinion on videos of him being affectionate with women and children in photoshoots. Women have come out accusing him of “sexual misconduct” or something. Never trust what you see and hear. As you judge Joe Biden, so you will be judged. Don’t do unto others what you wouldn’t want done unto you. One man G. said that he knows not to trust his eyes. He told the story of seeing a photograph that he thought he recognized, but was wrong. But he trusts what he sees spiritually, and hearing what Jesse told him earlier in Church today, he knew Jesse was telling him the truth. Jesse took some final questions from people (both on and off-air). He announced that we will not have our usual Women’s Forum this month, as he will be out-of-town. For people in San Francisco, he’ll be up speaking on the 18th. Contact BOND with your info so that we can give details, in case you’re able to attend.